Animal Farm Video Game Coming Soon | Nerd Much? "We’re heading into an era uncomfortably similar to the universe described by George Orwell." It’s barely off the ground yet, nothing more than the final draft of a pitch, but it sure has our attention. A few game developers are keen on turning George Orwell’s Animal Farm into a video game. The members involved are Imre Jele (RuneScape), George Baker (Fable), Kate Saxon (The Witcher 3), Jessica Curry (Everybody’s Gone to the Rapture) and Andy Payne (Gambitious). To do so, there will be two sections of the game. One will follow the life a particular barnyard animal as they struggle through their rapidly changing world. The second will be more like a strategy game, involving choices for the player to make about the management and maintenance of the farm. Again, nothing short of inspiring. Jele is absolutely correct that artists of all mediums, especially that of video games, have the responsibility to offer perspectives and experiences that some people might not otherwise discover. 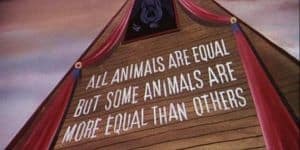 As is also stated the game’s website, these current political conditions are the perfect time to think about Animal Farm and the lesson Orwell has tried to so hard to teach us. even with all of that aside, Animal Farm seems like a natural progression from We Happy Few, a game that adapts Aldous Huxley’s A Brave New World. Showing us yet again, where extremes can lead us. Again, there is no release date, nor any proper title or platform for the game to appear on. Hopefully we will learn more soon in the coming years. Source: Polygon, Animal Farm Website, and the 1954 cartoon if you don’t feel like reading the novel.